So, how much electricity does an air conditioner AC use? No one wants to feel miserable during the hottest months of the year. When it is scorching hot outside, it can be very difficult to feel productive. You do not want to have to deal with this type of heat all day and you need to be able to keep things pleasant inside of your home. For this reason, many people turn to using air conditioning units regularly during the summer. In the hottest parts of North America, air conditioning is seen as an absolute necessity by some. When the temperatures are regularly near or above 100 degrees Fahrenheit, it is easy to see why people would want a bit of relief. Modern air conditioning units are fantastic when it comes to keeping an environment nice and cool. They are capable of regulating the temperature of your home and can keep things set at a specific temperature. This means that you will not have to feel too cold or too hot. The problem with air conditioning units presents itself when you start thinking about energy efficiency. You see, in modern times, people are becoming very concerned with the environment. Environmental issues are at the forefront of human consciousness at the moment and the amount of electricity that you are using plays a direct role in everything. Keeping yourself from using too much electricity can help the environment and it can also save you from having a high energy bill. Using air conditioning units that use up too much electricity will wind up costing you a lot of money. Air conditioning is notorious for helping people to run up their monthly energy bills. When you use your air conditioner every single day, it is going to have an impact on your electricity usage. Even so, it is possible to buy air conditioners that are more energy efficient so that you won’t have to worry so much. The amount of electricity that your air conditioner uses is going to differ depending on the model. Every air conditioner is going to use a certain number of watts per hour. The average central air conditioning unit will use somewhere between 3000 and 5000 watts of power every hour that it is in use. Using these numbers, you will be able to calculate how much using your air conditioner is going to cost you. Your power company is going to charge you based on how many kilowatts of power you are using. Many power companies will charge a rate of $0.10 per kilowatt whereas some might be charging $0.14 per kilowatt. You should be able to look at your energy bill to determine what rate your power company is charging you. Once you have this information, you just need to determine the wattage of your air conditioning unit and do the math. 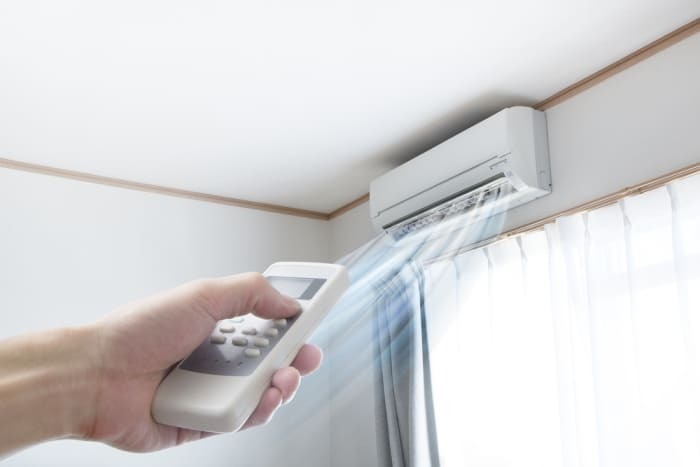 If you were to assume that you will be running your air conditioner for eight hours per day and your AC unit runs at 3500 watts, then it will be putting out 28 kilowatts per day. This will put you at a point where you will be paying somewhere between 85 and 100 dollars every month to run your air conditioning for this amount of time. Keep in mind that most people will be using their air conditioning less often than eight hours per day. Also, you are likely only going to be using your air conditioner during certain times of the year. One thing that you should know is that older air conditioning units are likely to be less efficient than newer models. If you are still making use of an older type of window unit, then it may be using a lot more power to cool down your home than a central air unit. Modern central air units are likely to be the most efficient type of air conditioner that you can buy. They will work to cool your entire home through the vents and will be able to do so as efficiently as possible. Older units don’t adhere to the same standards as the air conditioners of today. There are many energy-efficient window air conditioners on the market too but they are usually better at cooling small areas. Using air conditioners such as this in an attempt to cool an entire home can be difficult. It may lead to you running the air conditioner for longer periods of time than you would like and this causes you to use more electricity. You will see the impact of this on your power bill at the end of each month. Determining just how efficient your older air conditioner is will be beneficial. You should try to crunch some numbers to see whether it is going to be cost-effective to simply upgrade. In some cases, buying a new unit will be able to save you money within a short amount of time. It is worth looking into things so that you can limit your environmental impact and save yourself a bit of cash. It is very possible that buying a newer-model air conditioner will be a cost-effective measure to take. If you have an older type of air conditioner, then you will be able to save quite a bit of money on your monthly bills. If you go from using an air conditioner that uses a lot of power to using a more efficient central air unit, then you’ll be able to justify the cost very easily. There are many benefits to using a more efficient cooling system too. Your home will be more temperate when you make use of a central cooling system. It is easier to regulate the temperature of your entire home to keep it set at a specific setting. Not all older styles of air conditioners feature settings such as this so it is good to have the option. You could set your air conditioner to keep things at a comfortable 72 degrees Fahrenheit and then not have to worry about anything at all. Look into the most efficient models on the market and you should be able to make some calculations. Even when you factor in the cost of a new air conditioning unit, it is possible that the air conditioner will pay for itself over the course of a few years. This depends on just how much better the new AC is when compared to your older model. If it is a huge difference, then you will be able to enjoy more savings. Even when you are using a very efficient air conditioner, it is possible to have high bills when you need to run it all the time. If you are living in a very hot area, then you might be using your air conditioning for many hours out of the day. There are even people who use their air conditioners constantly during the summer months. That being said, you can try to only use the AC when you truly need it. If you want to cut down on your electricity usage, then you can limit your air conditioning time as much as possible. Only turning the AC on when it is truly uncomfortable is a good idea. Trying to put up with mild heat can be effective so long as it isn’t putting your health at risk. Some people deal with heat better than others so you may wish to get the advice of your family physician if you have concerns. There are effective ways that you can keep yourself cool even without air conditioning. Opening a window can sometimes help to cool your home down by several degrees. If there is a breeze going outside, then you will be able to enjoy things even more. Cold showers and eating cold treats can also be a very nice way to beat the heat. Always remember to stay hydrated too and don’t avoid using your AC if you feel as if you really need a break. Limiting air conditioning usage to the hottest hours of the day can be a good idea. This will help to keep your home from getting too hot and you can try to keep those energy bills as low as you can. If you want to keep the air conditioner on at all times, you may want to set it at a higher temperature setting to save money. Setting the air conditioner to 75 degrees instead of 72 might help you out a bit, as an example. Depending on how often you need to use your air conditioning, you may wind up adding a lot of money to your monthly energy bills. The most efficient modern air conditioning units will be better at keeping the electricity usage lower, though. If you get a modern central air conditioning unit installed, then you can expect better results. Older models will have a tougher time remaining efficient but upgrading can be a cost-effective move to make. If you are truly worried about your electricity usage, then trying to limit it can be smart. Whatever your thoughts are about air conditioning and electricity issues, you will have an easier time when you’re armed with the proper knowledge. Knowing what to expect from your monthly bills is better than being blindsided by them. Be as prepared as possible and put yourself in a good position today. You’ll be able to stay cool while keeping as much money in your bank account as possible.